Saudi Arabia's post-Gulf War security challenge remains the all too common one of seeking to maintain a credible defense against mounting regional and internal threats within constraints of continuing budgetary shortfalls. Today, fiscal shortcomings, precipitated by the dramatic mid-1980s decline in global oil prices and exacerbated by the costs of Desert Storm together with normal problems of inadequate absorptive capacity for manning new technology have hamstrung ongoing Saudi efforts to build effective deterrent capabilities against both secular enemies such as Iraq and Iran and the rise of political Islam. These external threats are emerging in a social environment that is, at the same time, rife with seeds of potential political destabilization. A current internal trend toward religious fundamentalism "political Islam" combined with a backlash against an increased Western presence in the aftermath of Desert Storm, are now coalescing to produce political and socioeconomic climates more complex than those confronted in the past. Saudi Arabia and its regional neighbors are allies vital to America's strategic interests. The GCC states Saudi Arabia, Kuwait, the United Arab Emirates, Oman, Qatar, and Bahrain constitute America's fifth largest trading bloc worldwide. With more than half of U.S. oil consumption provided from abroad, and more than half of those imports derived from GCC production, the stability of the Gulf region is quintessential for American economic well-being. This analysis reviews the challenges confronting the largest GCC country, Saudi Arabia, in its efforts to build a viable defensive deterrent in the aftermath of Desert Storm. The analysis concludes that most force structure development goals remain unfulfilled because of funding demands driven by foreign and domestic issues. Saudi Arabia's $80 billion foreign aid commitment to arm Iraq against Iran in the 1980s, its $64 billion in Desert Storm commitments to disarm Iraq in the early 1990's, and other foreign aid commitments suggest reductions in future defense funding. Domestic issues could affect force structure modernization goals also. Divisions between Muslim fundamentalists and more secular Western-educated technocrats, a jockeying for power regarding political succession, shortfalls in productive jobs for aspiring Saudis, and a decade of economic retrenchment suggest the kinds of domestic issues that will affect basic decisions about whether to fund further arms purchases or to focus on providing for the economic welfare of a growing populace. Saudi Arabia's success in addressing this dilemma will determine the future stability of one of the United States' most reliable allies in the Near East region over the next several decades. The abrupt, and largely unanticipated, end of the Cold War in the early 1990s has thrust the Gulf Cooperation Council (GCC) states into an era of growing unrest and rapid geopolitical and socioeconomic change. Globally, an era has evolved marked by growing economic disparities, rising ethnic tensions, and mounting political uncertainty. These realities are particularly acute amongst the nation states that comprise the GCC, and for Saudi Arabia in particular. But within this dynamic, yet potentially destabilizing, political environment America's vital interests continue to be at stake. Those interests include a variety of key economic and defense imperatives: access to Gulf oil and regional markets, strategic political alliances, and vital logistics support and staging areas for military operations. Much of the U.S. Central Command's regional security planning, in fact, centers around the GCC nexus that serves as the concourse to three continents Europe, Africa, and Asia. Such stark realities invoke the need for greater western understanding of the challenges faced by U.S. allies in the region as they seek a balanced and effective force structure capable of confronting both regional pressures and destabilizing internal threats. This monograph addresses the attempts by Saudi Arabia to build a modern military in the post-Gulf War era. It commences with a summary review of Saudi external and internal concerns within its GCC operating environment, and proceeds to evaluate its ongoing quest for force structure modernization within tight budgetary constraints. The Arabian Peninsula's historic role as the concourse to great continents is a blessing mixed at best. For the region sits amidst a multiplicity of potential external threats. To the north lies Iraq, whose self-serving designs for the region occasioned the need for "Desert Storm" in 1991. To the northeast lies Iran, whose record of historic expansionism toward the Arabian Gulf, combined with a brand of "Shi'i" political Islam that stands in direct conflict with that practiced by America's more moderate "Sunni" GCC allies, make its current arms build-up in the region more ominous still. With a sizable collection of U.S. (F-5 and F-14) and Russian MIG aircraft (including more than 140 planes that defected from Iraq during the Gulf War), it possesses the largest air force in the region. The states of the Peninsula today feel threatened, in particular, by Iran's possession of Chinese "Silk Worm" missiles, and its recent introduction of "kilo class" Russian-made submarines into the Arabian Sea. To the south lies Yemen, a country historically more ideologically aligned with the East than with the West and now further strengthened by the unification of its north and south and the consolidation of their respective militaries into a powerful force that possesses large inventories of Russian MIGS, tanks, and other offensive hardware. 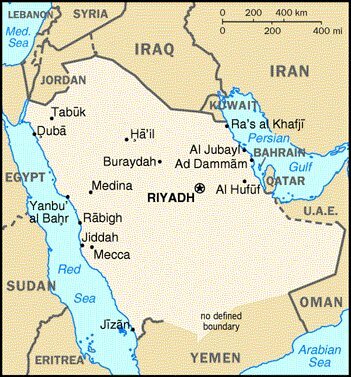 Border disputes on its northern border with Saudi Arabia are an especially long-standing problem. To the west, lie Egypt and the Sudan, two other large Islamic countries also increasingly susceptible to the rise of unfriendly political causes advanced in the name of religious fundamentalism. Not only are Saudi Arabia and the other GCC states imperiled externally, they are challenged internally as well. The GCC economies, which are driven primarily by oil production, have been dramatically retrenching ever since the abrupt downturn in world oil market prices in the mid-1980s, with the restructuring having serious domestic consequences. Among them, a new generation of young Gulf Arabs now is growing up having to work twice as hard just to earn half as much as their parents did creating potentials for mounting economic disaffection. For local GCC populations are now expanding at a prodigious pace, creating job demands that a "single crop, oil-based economy" often can't provide. This new generation, one of the fastest growing in the world, with a 5% per annum increase, likewise is growing up increasingly less familiar and comfortable with western values. As with local educational infrastructures now in place, there are markedly diminished opportunities for that cross-cultural fertilization that comes with studying abroad. Accordingly, while most GCC states are still largely administered by proficient technocrats who became America's friends and allies as a result of having been educated in the West in the 1975-1985 "oil boom" decade, they will eventually be replaced by a new generation for whom U. S. values and interests are more alien. The problem is compounded by ongoing fundamentalist distancing from Western economic and political interests on the part of local religious elites. Traditionally isolated from the course of global events, these local molders of public opinion were directly confronted in the conduct of Desert Storm with a Western values system with which they were wholly unfamiliar, and equally unimpressed. Yet it is precisely to the vocal views of these influential opinion leaders that this new generation is now directly exposed both in their schools and in their places of worship. Finally, the question of monarchic succession looms large on the political horizon. The aging reigning Saudi monarch, King Fahd bin 'Abd al-'Aziz, suffered a crippling cerebral stroke nearly two years ago, from which he has only partially recovered. While conventional wisdom has authority passing to the King's half brother, Crown Prince 'Abdullah bin 'Abd al-'Aziz, upon his demise, this prospect has not precluded significant jockeying for position within a prospective new government with another brother, Defense Minister Prince Sultan bin 'Abd al-'Aziz, and yet another brother, Central Region Prince Salman bin 'Abd al-'Aziz, expected to play increasingly more prominent roles. Already, the latter is increasingly involved in central government decision-making. Today, this quest for orderly succession is playing out with all of the subtlety of a U. S. presidential primary. There are distinct partisan divisions; and within them, key constituencies must be accommodated. With Crown Prince 'Abdullah serving as Commander of the Saudi Arabian National Guard, and Prince Sultan heading the Saudi Ministry of Defense and Aviation -- two major security agencies vying for new weapons systems funding -- these relative power shifts likewise could significantly impact on the shaping of future defense procurement decisions. As at the bottom line, such decisions must clearly "factor in" the capabilities of proposed defense acquisitions to create jobs within the economic bases of key political core constituencies. The fiscal impacts of Desert Storm upon the well-being of Saudi Arabia were as monumental as their geopolitical counterparts. Its costs in military operations, operations reimbursements, and regional aid commitments are estimated at $64 billion, in an economy whose 1991 GDP was just over $100 billion. To put those sums into perspective, had the United States acquired an equivalent war debt relative to its GDP, the total would approach $5 trillion, an amount equal to America's current aggregate national debt acquired over decades. (1) Though a $186 million current account surplus was realized in 1996, due primarily to higher oil prices at year's end, this was the first such surplus since 1984. (2) Continuing an unbroken string of unbalanced budgets that commenced in the mid-1980s, the Kingdom's 1996 budget deficit came in at $4.5 billion, some 3% of GDP, on total public sector spending of $51.7 billion. (4) Due primarily to global oil price increases, GDP grew 8.6% in nominal terms in 1996 (about 4% in real terms), and per capita GDP grew by $100 to $6,800. Put into perspective, that total is less than 1/4th of U.S. per capita GDP which stands at about $28,000, belying myths of Saudi opulence. With global oil prices briefly approaching $22.50 per barrel at the close of 1996, plans for significant defense sector purchases particularly in tanks, multi-role fighter aircraft, rotary wing aircraft, and airborne refueling tankers were temporarily revived. Indeed, purchases from France of 12 combat search and rescue "Cougar" helicopters and an additional F-3000-S frigate were announced in early 1997; and negotiations for the purchase of 102 "Block 50" F-16C/D tactical fighters from U.S. Fort Worth, Texas-based Lockheed Martin were actively pursued. Oil market performances in 1997, however, witnessed sharp declines in global prices down some $5.50 per barrel from their December, 1996 high and hovering in the $17 per barrel range where the Saudi budget, with its aforesaid in-built $4.5 billion deficit, breaks even. While industry analysts see significant demand growth for crude oil, buoyant supply growth likewise is forecast on a worldwide basis. Indeed, if oil prices continue to decline, and the government maintains spending at its budgeted levels, real 1997 GDP growth could fall back from 4% to 1%-2% or even negative figures. Such regressive economic trends do not bode well for major near term defense system acquisitions. While significant reductions in payments required to retire massive post-Gulf War FMS weapons debts are to commence in 1998, potentially freeing up some $3-$4 billion in acquisitions monies, moreover, such funds could alternately be allocated to pressing economic infrastructure and social welfare needs rather than to additional arms procurements. Unlike U.S. defense procurements, governed by detailed, published rules, the Saudi acquisitions process is often less explicit and an accurate understanding of underlying budgetary procedures must be heuristically derived. For in the Kingdom, the process employed is that defined by the nation's most senior leadership in any particular circumstance, and may not necessarily be that chosen in a future similar context. Also, in arms procurements, political, religious, social, and economic factors, as well as force structure development requirements, must often be accommodated. Such decisions evolve, moreover, in an environment where the senior political leadership all sons of the Saudi dynasty's founder, King 'Abd al-'Aziz simultaneously control the nation's security forces. Crown Prince 'Abdullah, a half brother of the King, commands the Saudi Arabian National Guard (SANG). Prince Sultan, a full brother of the King, heads the Ministry of Defense and Aviation (MODA). Prince Na'if, yet another full brother, heads the Ministry of Interior (MOI). 1. Requirements are initially defined at the unit level. Budgetary priorities are for training, sustainment, and modernization. 2. There is no service-level acquisitions budget per se. Service-level commanders build unit requirements into service five year plans, force structure development roadmaps (fires, airlift, training, etc.) and service-wide modernization plans. All unit level procurement requests are evaluated and prioritized at the service level. Though the Saudi Arabian Ministry of Defense and Aviation (MODA) staff play a key planning, budgeting, and acquisition role, it is not uncommon for service commanders to take requirements directly to the Minister of Defense, bypassing the Chief of Staff. The four principal services are the "Royal Saudi Land Forces (RSLF); the "Royal Saudi Air Force" (RSAF); the "Royal Saudi Naval Forces" (RSNF); and the "Royal Saudi Air Defense Forces (RSADF)." (The RSADF is co-funded with the RSLF for FMS procurement purposes.) The Saudi Arabian National Guard (SANG) operates independently of MODA and reports directly to Crown Prince 'Abdullah. 3. The Ministry of Defense prioritizes and integrates service level requirements into a MODA five year plan, consolidated force structure development roadmap, and modernization plan. Program approvals, budgets, and contracting are managed at the MODA level. 5. If the program is unfunded and unapproved, the Minister of Defense may send it to either the Council of Ministers or directly to the Royal Court for the King's approval. The role of Crown Prince 'Abdullah in this approvals process consists of frequently chairing the Council of Ministers and serving as the most senior member of the Royal Court. 6. The Royal Court submits the program to the King, who issues a decree approving both the program and its funding. 7. Defense procurements are frequently transacted as "off-budget" undertakings not subject to the workings of the fiscal process described above. It is estimated that more than 20% of Saudi Arabia's 1996 oil revenues, for instance, were committed to off-budget projects. Thus, official budget numbers are often not a reliable indicator of forthcoming acquisition. Saudi Arabia emerged from the 1991 Gulf War both determined and sobered that, despite significant weapons acquisitions in the late 1970s and throughout the 1980s, the nation's military capacity remained inadequate for deterrence and defense. Accordingly, directly exposed to the potent capabilities of modern weapons technologies for the first time, a determined effort was initiated to develop a defense more capable of meeting perceived regional threats. The challenge was significant. The Kingdom's "post-Gulf War" Ministry of Defense and Aviation (MODA) major military forces stood at approximately 102,000 troops divided amongst the four services: the Royal Saudi Land Forces (RSLF), Royal Saudi Air Force (RSAF), Royal Saudi Naval Force (RSNF), and Royal Saudi Air Defense Force (RSADF). These forces are briefly outline here based on information contained in such publications as the Defense Foreign Affairs Handbook, 1990-1991 and the U.K. International Institute for Strategic Studies publication "Military Balance: 1992-1993. 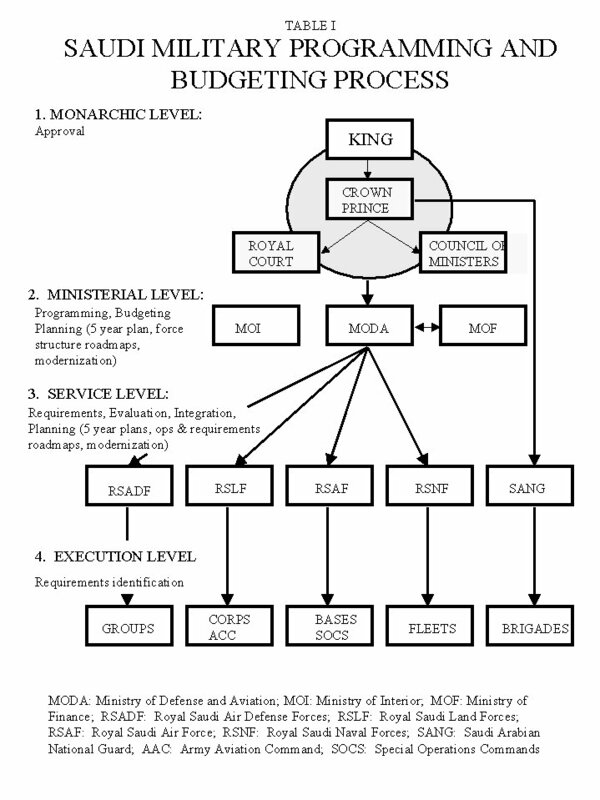 "2 The organizational structures and disaggregated major equipment configurations for each of MODA's four combat arms branches in the immediate aftermath of the Gulf War were as follows. The Royal Saudi Land Forces (RSLF) consisted of some 50,000 soldiers organized into armored, airborne, and mechanized infantry brigades. Their ground weapons inventory included M60-A3 tanks, armored personnel carriers, recovery vehicles, howitzers, and committed but not yet accessioned M1-A2 tanks and Bradley M2-A2 fighting vehicles. Their airborne capability included UH-60 Desert Hawk and OH-58 Combat Scout helicopters and committed, but not yet accessioned, AH-64 Apache helicopters. (2 airborne battalions and 3 special forces companies). the Eastern Area Command at Dhahran, which contains a mechanized infantry battalion. the Northern Area Command at Hafr al-Batin, which contains the 20th Mechanized Brigade and the 1st Aviation Battalion. the Northwest Area Command at Tabuk, which contains the 12th Armor Brigade, the 8th Mechanized Brigade, and an Airborne Brigade. the Southern Area Command at Khamis Mushayt, which contains the 4th Armor Brigade, 10th Mechanized Brigade, and 11th Mechanized Brigade. the Western Area Command at Jeddah. King Faisal Airbase, Tabuk, which houses the 2nd strike squadron (F-5s). Jeddah Airbase, Jeddah, which houses the 4th and 20th transport squadrons (C-130s). King Khalid Airbase, Khamis Mushayt, which houses the 6th, 15th, 34th and 66th fighter/intercept/reconnaissance squadrons (F-l5s/Tornados/F-5s). King Fahd Airbase, al-Ta'if, which houses the 3rd, 5th, and l0th fighter/training squadrons (F-l5s/F-5s), the 12th and 14th helicopter squadrons (Agusta Bell (AB) 205s and 212s),as well as the l7th reconnaissance squadron (RF-5s). Riyadh Airbase, Riyadh, which houses the lst, 16th, and l8th transportation/electronic warfare squadrons (E-3As/C-130s/others). King 'Abd al-'Aziz Airbase, Dhahran, which houses the 7th, 13th, and 29th fighter/bomber squadrons (Tornados/F-l5s). King Fahd Naval Base, Jeddah. King 'Abd al-'Aziz Naval Base, Jubail. Western Fleet, Red Sea (Jeddah HQ). Eastern Fleet, Arabian Gulf (Jubail HQ). Al-Dammam, Ra's al-Mishab, and Ra's al-Ghar naval bases. (1) lst (Central) Air Defense Group, Riyadh, consisting of 3 Hawk batteries and 2 Oerlikon batteries. (2) 2nd (Western) Air Defense Group, Jeddah, consisting of 3 Hawk batteries, 2 Oerlikon batteries, 1 Crotale battery, 1 Shahine battalion, 1 Oerlikon battalion, 2/30 mm Sabre batteries, and the Air Defense Institute. (3) 3rd (Northwest) Air Defense Group, Tabuk, consisting of 2 Hawk batteries and 1 Shahine battalion. (5) 5th (Eastern) Air Defense Group, Dhahran, consisting of 6 Hawk batteries, 12 Oerlikon batteries, 5 Crotale batteries, and 1 Shahine battalion. The Saudis emerged from Desert Storm sobered by the realization that their force structure development goals were not commensurate with the regional threats that they confronted. Accordingly, they candidly identified shortcomings, and carefully planned for their elimination. Witnessing first hand the technological advantages of modern warfare, particularly those possessed by the United States, they aspired to the deterrent capabilities that they afforded. Recognizing their economic as well military challenges, they thus embarked upon a strategy to simultaneously solve both creating technology-based military jobs through defense systems acquisitions. To this end, a development program known as "offset" was implemented requiring foreign defense contractors to reinvest up to 30% of their pre-tax profits in joint venture projects that build economic infrastructure that contributes to local industrial diversification. Currently, 15 "offset" projects primarily in military hardware systems maintenance/ overhaul and communications have been created. Yet since the end of Desert Storm, and despite ongoing modernization planning, the Kingdom has enjoyed only limited success in meeting force structure development goals. Severe budgetary cutbacks, occasioned by war debt and fiscal downturns, have caused significant disruptions in programmed MODA force upgrades and expansions in the 1991-1997 period. The price of Desert Storm, as noted, has been conservatively estimated at $64 billion, in an economy whose 1991 GDP was about $l00 billion. The resulting acquisitions budget crunch has caused many major projects, such as Sulayyil Airbase, scheduled for opening in the Southern Region in l994, to be suspended leaving Khamis Mushayt as the Kingdom's only significant air base in the south. With many major post-Gulf War military acquisitions not yet fielded, military organizational changes to accommodate the new hardware procurements, in many cases, have yet to take place. 2,400 Hummer (HUMMV) Vehicles ($123 million). 2,486 BMY trucks ($247 million). 12 Apache AH 64 helicopters with Hellfire missiles. 6 French "Super Puma" helicopters and 20 small patrol boats ($200 million). 12 French Crotale SAM batteries ($680 million). 12 F-l5 combat fighter replacement aircraft. 150 M60-A3 tanks ($206 million). 50 Stinger missiles + 150 reloads ($12 million). 24 F-15 AIM-9L Sidewinder air interdiction missiles and l0,000 Astro rockets from Brazil. 550 M2-A2 Bradley fighting vehicles. 207 M113 armored personnel carriers. 14 additional Patriot PAC-II missile systems. l00 German Fuchs NBC vehicles, 50 Gerhard armored personnel carriers, and l00 Marder fighting vehicles; and a French "Mistral" air defense system. The costs of many of these programs were significant, as indicated in Table II. The first tranches of some of these systems are just now beginning to arrive in the Kingdom, though the delivery of others, such as the first French F-3000-S frigate, have been postponed to the year 2002. Other key programs have also been postponed indefinitely. A comprehensive U.S.-Saudi "Joint Security Review" (JSR), completed immediately after Desert Storm in the summer of l99l, was designed to be the master blueprint driving future Saudi force expansion. In light of the cash flow crunch caused by the war effort, however, MODA was compelled to dedicate a major share of its budgeted resources to liquidating its "big ticket item" FMS purchases and to conduct its own internal force development review to adapt the JSR to budgetary exigencies leaving the procurement process effectively in stasis. A commitment to buy 150 additional M1-A2 tanks, for instance, has been held up for four years. In addition to some 315 Ml-A2 tanks to be purchased from General Dynamics, the RSLF's fighting capability would be augmented by the acquisition of as many as 550 M2-A2 Bradley Fighting Vehicles. Several new armor and mechanized infantry brigades, as well as several new military operating bases, were contemplated. Projected new additions to RSAF capabilities included the purchase of 72 F-l5 tactical fighter aircraft from McDonnell Douglas, 48 Tornados from British Aerospace, and various other new long-range interdiction aircraft to augment both air-to-air and air-to-ground combat capability, including the possible acquisition of four F-16 or similar type multi-purpose tactical fighter squadrons. Projected RSNF fleet acquisitions included the three new French frigates, naval and marine transport and special operations helicopters, and various maritime patrol boats as well as the formation of several new "naval infantry" (marine) battalions. Having committed to purchasing eight U.S. Patriot PAC-II air defense missile systems from Raytheon Corporation, the RSADF likewise was to have acquired 14 more PAC-II Patriot missile systems and additional Short Range Air Defense (SHORAD) batteries as well as various other new missile, radar, and satellite communications systems and passive electronic warfare (EW) jamming systems, and attendant installation security systems. Aggregate hardware costs for the program's implementation were estimated at slightly more than $49 billion in 1991 dollars. Because of aforesaid budgetary constraints, however, few of these goals have been achieved and many more have yet to be attempted. Since the onset of Desert Shield in August, 1991, for instance, $24 billion in Saudi FMS sales have been contracted for seven principal U.S.- provided MODA programs. By 1997, $21 of this $24 billion in FMS-funded weapons systems had yet to be delivered and $9.15 billion in Saudi FMS payments had yet to be made. It should be further noted that future MODA military hardware acquisitions are competing directly for revenue dollars with $20.7 billion in Saudi National Guard FMS procurements for several fully equipped Light Armored Vehicle (LAV) brigades and 7000 HUMM-V vehicles. Any analysis of the capability of Saudi military services to assimilate modern new technologies must commence with manpower constraints. As operations and manning requirements involved in fully implementing the Saudi force structure development plan would require doubling the size of the organic MODA forces to more than 200,000 men. Other major systems acquisitions, moreover, inflate this requirement further still. The problem is more qualitative than quantitative as in an era of fiscal constraint, many young Saudis remain unemployed or underemployed. Thus, the anomaly arises of high unemployment existing amongst a multitude of technology-based jobs that go unfilled for want of training. Literacy rates are relatively low, being officially estimated at 62% 73% for males and 48% for females. Yet the challenge faced is checkered. With the Royal Saudi Air Force's high admissions standards, literacy and English competency levels are quite exemplary. With the Saudi National Guard, on the other hand, where appointments are made based more on political and tribal factors, the opposite is true. The challenge is complicated by cultural considerations as with noteworthy exceptions, there is a significant under-ability to assimilate and analyze new technology concepts. The problem is basic and pervasive. Whereas Americans are generally taught to challenge and analyze, Saudis are taught to memorize and accept. (Many have memorized the Qur'an). Thus, those who tend to excel in techniques whose mastery requires rote memory may nonetheless be challenged by scenarios requiring key analysis and independent action. (1) private business labor forces must consist of not less than 75% Saudi nationals. (2) that not less than 5% of the work force at any given time must be Saudis in training to replace expatriates, foreign firms operating in the Kingdom have for years taken advantage of a technical provision waiving those legal requirements in the event of labor shortage. For this reason, most of the Kingdom's military operations and maintenance (O & M) contracts remain in foreign contractors' hands, as described in Section III, below. Indications are, however, that with the ongoing restructuring of the local economy, and with substantial numbers of Saudis now unemployed, such waivers will be greatly reduced, if not eliminated altogether, in forthcoming years. For "Saudization" has been targeted amongst the highest priorities of the Kingdom's Sixth Five Year Development Plan: 1995-2000, which has completed its second year in implementation. In November, 1996, the government announced termination of work visas for fourteen categories of expatriate personnel, and reduction from two to one year duration of work visas for thirteen other job categories traditionally held by third country nationals (TCNs). Human resource development for local manpower was also highlighted in the nation's Saudi Riyal 181 billion (U.S. $48.3 billion) 1997 operating budget announced on 31 December, 1996. Local manpower development, moreover, was simultaneously the prime focus of a media interview with King Fahd commemorating his 16th year of service to the Kingdom. These official shifts in manpower development priorities quite naturally pose serious implications both for public budgets and local employment levels; and for the aftermarket personnel service support contracts now held by foreign firms maintaining military hardware. Because of a non-discrimination clause in local labor law, Saudis must be paid at wage rates comparable to foreign counterparts for equivalent positions. This requirement means that jobs currently held by TCNs and remunerated at annual salaries of (U.S.) $3,500 to $5,000 could now require as much as a ten-fold increase in salary requirements in the near term when assigned to Saudis. Double job slotting of expert expatriates and Saudi "apprentices in training" may also soon be mandated. (1) Higher levels of Saudi employment and attendant reduced demands for revenue funded social welfare assistance. (2) A concomitant reduction in the need for massive publicly-subsidized services infrastructure now required to support both unemployed Saudis and job-holding expatriates. (3) The financial stimulus of recirculating locally paid wages through the Saudi economy rather than having them exported as expatriate repatriations to foreign countries. Locals hired under this "Saudization" process will either be enlisted soldiers organic to a military service or contract civilians. In either case, their costs will come from military operating budgets. Thus, forthcoming, dramatically altered military manpower requirements could impact significantly both on sustaining organic weapons systems' operational capability and in diminishing already inadequate military acquisitions financial resources. To compensate for its indigenous manpower shortcomings, Saudi Arabia has traditionally "contracted out" much of its weapons systems procurement management and operations and maintenance support. To this end, from a procurement management standpoint, MODA has relied heavily on the U.S. Foreign Military Sales (FMS) system and its local component, the U. S. Military Training Mission (USMTM). The system, in its lifetime, has presided over more than $60 billion in U.S. military sales to the Kingdom. Indeed, at its post Gulf War peak in 1991-1993, the USMTM was administering some $27.1 billion in Saudi FMS procurements from the United States some $24 billion in new acquisitions and $3.1 billion in pre-Gulf War programs apportioned amongst its army, navy, and air force sections. The "Army Section" accounted for $10.9 billion of these funds having responsibility for such major acquisitions as the M1-A2 Abrahms Tank, the M2-A2 Bradley Fighting Vehicle, AH-64 Apache and UH-60 Desert Hawk helicopters, TOW anti-tank weapons, and the Patriot PAC-II Missile System. Between l991 and l993, it delivered over 14,000 wheeled vehicles, 266 Bradley Fighting Vehicles, 154 M1-A2 tanks, 32 Multiple Launch Rocket Systems (MLRS), twelve AH-64 Apache and four OH-58 Bell Combat Scout helicopters, eight medivac helicopters, and eight Patriot PAC-II missile units to the Saudi military. The "Navy Section," in turn, was responsible for supplying naval patrol craft, communications hardware and C3I system upgrades, and various training programs totaling about $3.3 billion. The remaining FMS cases were the responsibility of the "Air Force Section" which monitored procurement and operation of MODA's F-l5s, C-l30s, E-3A AWACS, KE-3 Tankers and associated C3I and electronic warfare systems. Today, however, that historic reliance is perceptibly diminishing. As there is a growing perception among Saudi procurement officials that in its zeal to compel procurement restraint to preserve the fiscal soundness of its own FMS budgets, the FMS system has behaved somewhat imperiously, encroaching on the Kingdom's traditional sovereignty by interfering in its ability to contract other military acquisitions. Consequently, it has begun direct dialogue with numerous western defense contractors exploring the feasibility of direct commercial sales and taking management of the "Peace Shield" AWAKES system out of military control. Though this approach would both deny MODA the operational comfort of US-guaranteed turnkey weapons systems, and defense contractors a modicum of payments security, many believe that such direct commercial contracts will be the local "procurement vehicle of the future." Complex and arcane releasability issues such as requiring official notification of intent to purchase before equipment configuration can be negotiated and the sometimes bruising public nature of the Congressional notification process likewise are deemed vexious issues challenging future Saudi weapons procurements from the United States. Because of a desire for technology transfer, and an highly inadequate local skills/training base, foreign defense contractors remain heavily relied upon to provide weapons systems training and maintenance. Typically, an original equipment manufacturer (OEM) selling the military hardware system will be given a three year maintenance contract, and at least one other three year follow-on maintenance contract, before the maintenance requirement is tendered out to foreign technology partner/local Saudi partner joint ventures. This is a significant defense market niche. Within the RSAF, for example, over $2 billion in aircraft O&M and support service contracts are paid out each year. Indicative of such projects, McDonnell Douglas maintains the RSAF F-l5 fleet, subcontracting the engine maintenance component to Pratt and Whitney. British Aerospace is in charge of maintenance of the Tornados, with Rolls Royce responsible for engine maintenance. Scheduled engine upgrades on F-l5 (F-l00-PW) engines likewise resulted in an initial contract in excess of $350 million. Many American companies participate in this services out-sourcing process. Lear Siegler, for example, currently has an RSAF manning contract to provide technical service support to the Kingdom's F-5 fleet though much of the actual maintenance is performed by qualified Saudi technicians, who perform level 1 and level 2 maintenance, with more complex, depot level engine maintenance exported overseas. In this instance, as a quarter century old program, some measure of Saudization has been achieved. Generally, however, local O&M work forces tend to consist of Western corporate managers, retired Western military maintenance supervisors, and lower skilled maintenance specialists recruited primarily from the Indian subcontinent, East Asia and the Philippines. (i) a doubling of the size of the highly paid Saudi armed forces is required just to operate already programmed military acquisitions. (ii) that private local companies not required to pay wages and benefits at military levels can also adequately provide the maintenance function; a near term bias toward a privatized approach may be evident. However, the degree to which this approach, vis-.-vis its service organic alternative, detracts from operational capability has yet to be resolved. Thirteen examples of sizable recurring O & M projects within MODA now run by foreign firms are presented at Appendix 2. It must be emphasized that this sample is selected from across the various military services for demonstration purposes and as such, is illustrative rather than exhaustive. There reportedly are, for example, at least 75 O&M projects administered by RSAF alone, each having value of $1 million or more. This monograph has briefly reviewed key aspects of Saudi Arabia's quest for defense force structure modernization within the context of the nation's ongoing weapons acquisitions process. While significant progress has been made within the past two decades, due to severe budgetary constraints and the inordinate costs of Desert Storm, a majority of the goals of its extensive force structure development roadmap remain unfulfilled as 1998 begins. A consummate irony is that the Kingdom's $50 billion force modernization plans have been hamstrung by cash flow difficulties issuing, in large part, from its $80 billion in foreign aid commitments to arm Saddam Hussein vis-.-vis Iran in the late 1980s and an estimated $64 billion in Saudi Desert Storm commitments to disarm that same army in Kuwait in the early 1990s. Yet Iraq remains a threat, as does Iran, and even Yemen, with long-standing border disputes with the latter simmering just beneath the surface of a political veneer of amity. Internally, prospects for destabilization likewise remain. With a growing division between Muslim fundamentalists and more secular Western-educated technocrats who have traditionally run the country, combined with a current jockeying for power in political succession uncommon to Saudi Arabia, the prospects for internal fracturing cannot be summarily dismissed. Indeed, the challenge to maintain internal security goes to the heart of Saudi society itself. Today, a new, internally educated, more xenophobic generation is growing up strongly influenced by their fundamentalist teachers and increasingly estranged from Western values and even their more secular parents. The problem is exacerbated by a decade of internal economic retrenchment and an attendant shortfall in productive jobs for aspiring Saudis. The nation's leadership has looked to building a strong military both as a deterrent to external threat and as a source of employment for its secondary school and college graduates. Yet this undertaking has been quite seriously undermined by recurring financial shortfalls precipitated by the past decade's downturn in global oil prices, the cost of the Gulf War, and elaborate late l980s-early 1990s foreign aid commitments to such countries as Iraq and Yemen. Indeed, many of the MIG-29s that the Saudis now confront to their south were financed by their own early 1990s military assistance to South Yemen. Future prospects are hardly more promising; as while future global oil demand is predicted to grow robustly, supplies are projected to grow concomitantly. While reductions in the drawdown demands of post Gulf War FMS procurements will free up some potential acquisition funds commencing in 1998, moreover, the issue of whether those funds will be committed to further arms purchases or to providing for the economic welfare of a rapidly growing populace remains a conundrum essentially unresolved. Yet it is one clearly begging resolution as the Kingdom's ultimate success in addressing this dilemma likely will determine the future stability of one of the United States' most reliable allies in the Near East region for the next several decades. 3. Allocations for Operations and Maintenance. 4. Projects. Formal major weapons systems acquisition would appear as a Chapter 4 expenditure. 2. For detailed listings of order of battle/equipment see Defense Foreign Affairs Handbook: 1990-91 (Alexandria, VA: 1991), 841-44; The Military Balance: 1992-1993 (London: International Institute for Strategic Studies, 1992), 120-1. Pursuant to the al-Yamamah I program contracted between the Saudi and British governments in September, l985 involving the sale of 72 Tornado, 30 Hawk, and 30 PC-9 trainer aircraft BAE has a formal government-to-government agreement to support RSAF operations. An additional 48 Tornado aircraft have also been contracted. BAE also operates the Air Academy in Riyadh and the Technical Training School in Dhahran. A range of weapons and ground support services and equipment, plus construction of a variety of airbases and maintenance facilities, also formed part of this deal altogether estimated to be worth about $4 billion per year, with wide-ranging economic multiplier effects, to the U.K. aerospace industrial base. IAW contract provisions, BAE already currently provides technical assistance, maintenance, augmentation, and training for the Kingdom's Tornado aircraft fleet. While BAE is responsible for overall maintenance, engine maintenance is subcontracted to Rolls-Royce. Total BAE staff currently in Kingdom is approximately 4,000. To provide technical assistance, augmentation, and training for the RSAF fleet of 65 C-l30 aircraft. A technical staff of 650 U.S., 90 Saudi, and 40 TCN's is divided between operating locations in Jeddah and Riyadh. A separate contract for supply of C-130 spare parts held by Lockheed Middle East Services is renewed annually. The RSAF currently owns and operates 72 F-l5C Eagle fighter aircraft (and has contracted for an additional 72 F-15 Strike Eagles.) The manufacturer/support contractor, McDonnell Douglas, supplies approximately 700 technical staff to maintain the fleet, with the engine maintenance component subcontracted to Pratt and Whitney. While the majority of the technicians are located at RSAF airbases in Dhahran, Khamis Mushayt, and al-Ta'if, there also are several staff positions in Jeddah and Riyadh. This is a direct, sole source contract to McDonnell Douglas. To provide technically qualified contractor manning to augment, assist, train, and advise RSAF personnel on F-5 operations. The primary work sites include: King 'Abd al-'Aziz Air Base; King Fahd Air Base; King Khalid Air Base; King Faisal Air Base; and RSAF Headquarters. A staff of some 649 technicians, managers, analysts and trainers is provided. The manning positions and job descriptions are specified by RSAF. In the execution of this project, levels 1 and 2 engine maintenance are performed by RSAF personnel with support from Lear Siegler; whereas higher depot level engine maintenance is contracted overseas. To provide technical, operational, and managerial personnel for the RSAF air defense network. A manning level of about 570 technicians is contracted for deployment at twelve sites throughout the Kingdom, some 300 of which are British. The primary missions of the GENA program are: air surveillance, air identification, control of fighter-intercept aircraft, navigational assistance to aircraft, and control and coordination of associated air and ground combat forces. The AWACS system is scheduled to eventually replace this program. To design, fabricate, and test a Kingdom-wide air defense system employing AWACS. The original program scope was defined by USAF Electronics Systems Division (ESD) and MITRE and awarded to Boeing under a competitive bid in l983 for $3.2 billion. Hughes was awarded management of the system in 1992, in the aftermath of the Gulf War. The General Dynamics sale of 315 Ml-A2 Abrahms tanks to MODA contains an embedded full maintenance support contract. An option to procure an additional 150 tanks has not yet been exercised, and there are recurring 1997 reports that the RSLF are evaluating the desirability of French LeClerc and British Challenger II tanks as well. As there remains a standing land forces requirement for acquisition of 150 additional tanks. Bell Arabia operates and maintains a fleet of aircraft for the Medical Service Division medivac service. The fleet consists of 3 Gulfstream, one Lear Jet, and six rotary wing aircraft all of which are equipped for medical evacuation missions. The contractor work force consists of l67 persons, including management, pilots, flight crews, maintenance specialists, communications specialists, doctors, nurses, and program support specialists. SAIC installed the Saudi naval command, control, and communications C3 system in the early l980s. The current program involves about 50 technicians employed to maintain and upgrade the system. After the C3 system was commissioned and initial training had been completed, the SAIC staff began a phase-down. The Gulf War demonstrated a significant need for both software and systems upgrades, however, and MODA negotiated a staff increase and contract extension with SAIC. This project provides technical assistance, training, and support for the Kingdom's Patriot and Hawk air defense systems. The contract supports $1.5 billion worth of Patriots, consisting of 8 PAC-2 units, purchased by the Kingdom in two separate procurements executed since the end of the Gulf War. This FMS contract was a direct source procurement to the Patriot manufacturer, Raytheon, commencing in l992. A total of $4.l billion was initially allocated by the Saudi government for Patriot missile purchase, installation, and maintenance, with an additional $173.3 million for facilities construction. To provide operations, maintenance, and training for three E-3 AWACS Aircraft and seven KE-3A Tanker Aircraft. The contractor provides a staff of approximately 200 personnel in-Kingdom for training, aircraft and systems maintenance, flight operations, and program support. Depot level maintenance requirements are accomplished in the United States. To provide an approximate l60 person staffing level in qualified contract management, supervisors, and technical personnel to train, assist, augment, and advise RSAF staff in the maintenance of a mix of 57 AB-206, AB-212, and ASH-30 helicopters. The prime in-Kingdom site location is in al-Ta'if. Supply and maintain four F-2000 French frigates equipped with helicopter facilities and Astor surface-to-air missiles. Recent commitments have been made to procure three additional F-3000-S frigates. --Colsa International's contract with Saudi RSLF to modify and integrate its C3 system to incorporate new EW and air defense weapons systems. --Lear Siegler's l85 man directed manning project with the RSNF to provide shipboard classified equipment maintenance and repair. --BDM's RSAF engineering and technical logistics support and Peace Shield C3 modeling and simulation services contracts. --Booz Allen's ongoing technical assistance contracts with the RSNF and the M1-A2 "Project Sword" RSLF tank project. --MODA's National Defense Command Center's (NDCC) C3I system design undertaken by Hughes. --Vinnell's long-standing project for training the Saudi Arabian National Guard. The author, who is writing under a pseudonym, is a memeber of the U.S. Army Reserve. While on active duty, he served three tours in the Mideast region. He is a graduate of the U.S. Army Command and General Staff College. The author holds a doctoral degree in international studies, and he is a university lecturer in history and politics.